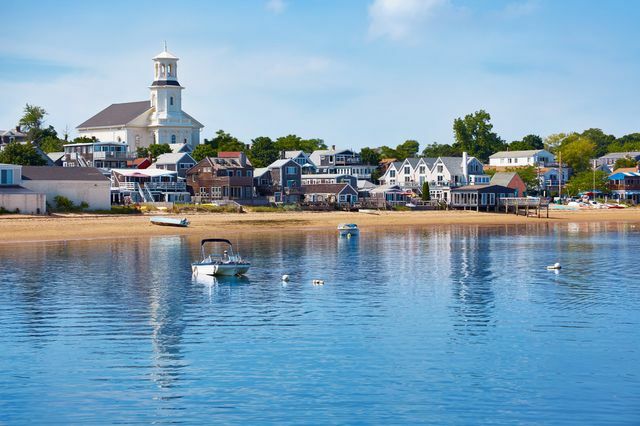 If you're looking for a honeymoon destination with nautical flair, Cape Cod is just the place! Planning a Cape Cod honeymoon and need help learning the ins and outs of the hook-shaped peninsula? We’ve got your back! The popular summertime destination, which is made up of charming villages, beautiful beaches and iconic lighthouses is also a great choice for nautical loving couples to spend their honeymoon. A Cape Cod honeymoon can consist of lots of exciting activities — like boating, fishing and biking — while also providing couples with plenty of museums and cultural landmarks to check out too. There’s something for every couple to experience if they opt for a Cape Cod honeymoon. A Cape Cod honeymoon is bound to surprise you, especially if you have a taste for adventure and the outdoors. Cape Cod is best enjoyed in the early summer and early fall. The weather remains pleasant, and Cape Cod honeymooners can avoid the bulk of the crowds visiting during the height of summer. John F. Kennedy Hyannis Museum: A rich museum offering a great experience with multimedia displays. Pilgrim Monument: A monument dedicated to the first landing of the Pilgrims that operates alongside the Provincetown Museum. Cape Cod Rail Road: Take this historic train through Cape Cod that offers dinner trips and scenic atmosphere. Shining Sea Bikeway: Great easy biking trail along thick woodlands and seascapes. Beaches: Spend your honeymoon lounging on clean, sandy beaches. Island Queen Ferry: A ferry dedicated to transporting travelers to Martha’s Vineyard. Sandwich Glass Museum: A quirky and informative museum all about glassworks. Boat Tours: Take a tour to explore the coast and maybe even catch a glimpse of a dolphin! Woods Hole Science Aquarium: Learn more about Cape Cod’s rich ocean life. Scenic Driving: Take some time to drive Cape Cod’s Route 6A and take in the gorgeous scenery along the way. Monomoy National Wildlife Refuge: Experience a relaxing, unspoiled area with great hiking trails and wildlife watching opportunities. Vineyards: Cape Cod is home to beautiful vineyards that offer tastings and tours.